I stumbled across this Rachel Ray recipe while searching on the Food Network website a couple of years ago and was completely surprised at how great it was. Of course, I had to make a few alterations to the recipe to make it the way I like it. I love the crust of this pizza – it’s super moist cornbread that is almost cake-like. And, you may notice a strange ingredient in the crust – sugar:) But, if you don’t put sugar in your cornbread, you are totally missing out. And, I know the toppings list looks lengthy, but you can really top this with anything you like. Most of these toppings are just suggestions. We make a lot of tacos in our household, so this was a great way to take an old classic and mix it up a bit. And, the leftovers are delicious! Mix muffin mix with egg, melted butter, milk, sugar and corn kernels. Lightly grease an 8×8 or 9×9 pan and pour in muffin mix. 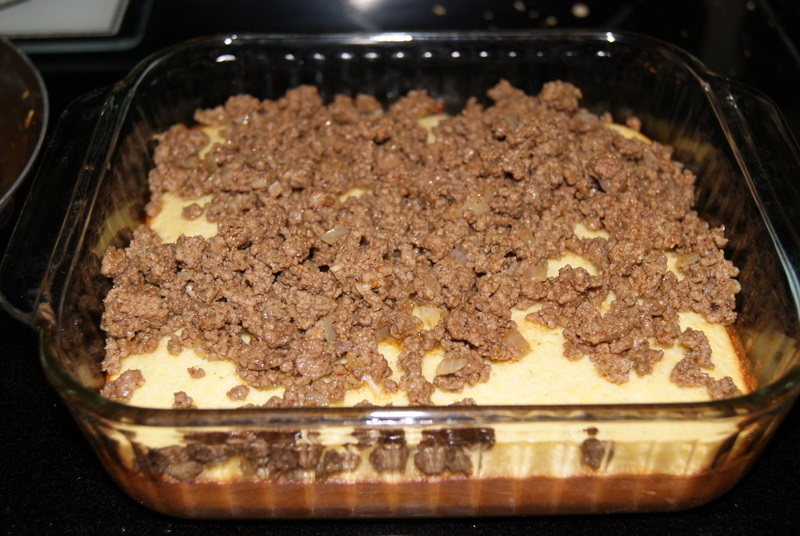 Bake for 12 to 15 minutes until top is lightly browned. Brown the meat over medium high heat in a second skillet in olive oil. 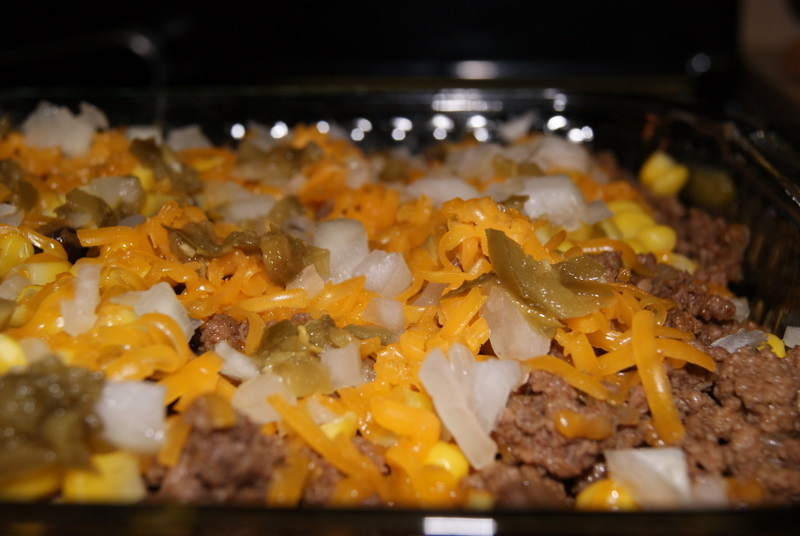 Add onions (I like to cook half of the onions with the meat, and use the other half as another topping) and taco seasoning, following taco seasoning instructions. 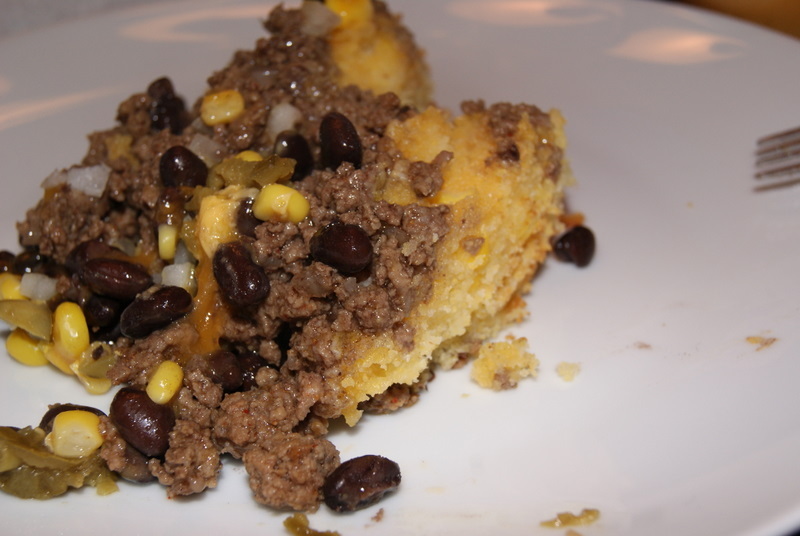 Remove cornbread from oven and top with meat, cheese, and beans. Add pan back to oven and cook 5 minutes more to melt cheese. Add remaining toppings and serve. 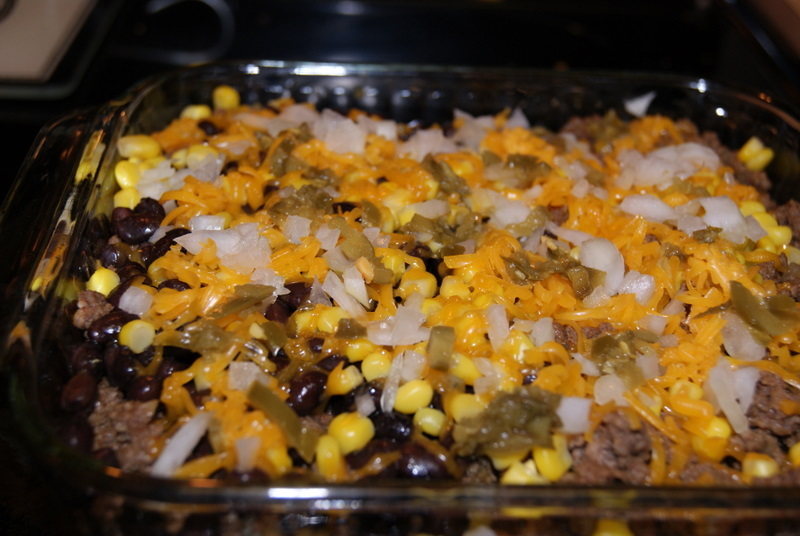 If you are looking for a delicious recipe to make for your next tailgate, look no further! This dip is one of my favorite go-to recipes whenever I’m asked to bring a dish to any function. I just got this recipe last year from my friend Ashley, and I’ve made it at least 20 times since then, especially during football season. I recently made this to snack on at our tailgate in Auburn and received tons of compliments as well as one marriage proposal;) So, that really says it all! This recipe is super easy – basically the only prep-time involved is shredding the swiss cheese. Preheat oven to 350 º. Mix cream cheese, mayonnaise, and swiss together until combined. Bake for 15-20 minutes until cheese is bubbly and melted throughout. 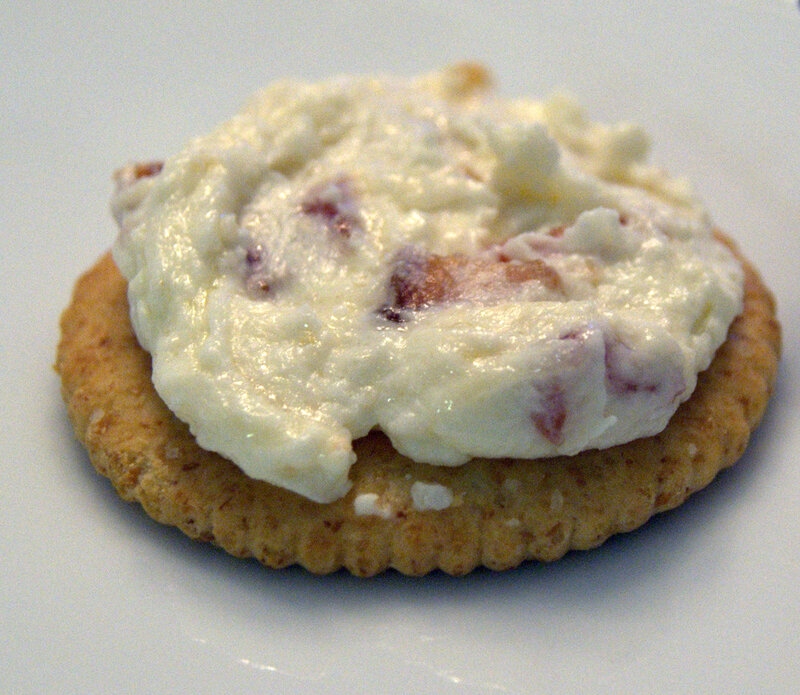 Mix in the crumbled bacon and onions and serve warm or at room temperature with crackers. To make this even easier on myself, I usually use the pre-cooked bacon. If you have never tried this, now is the time! I stuck up my nose to this for years, but my grandmother recently forced me to try it and it’s my new favorite thing. This chicken is such a great dinner – delicious and easy. 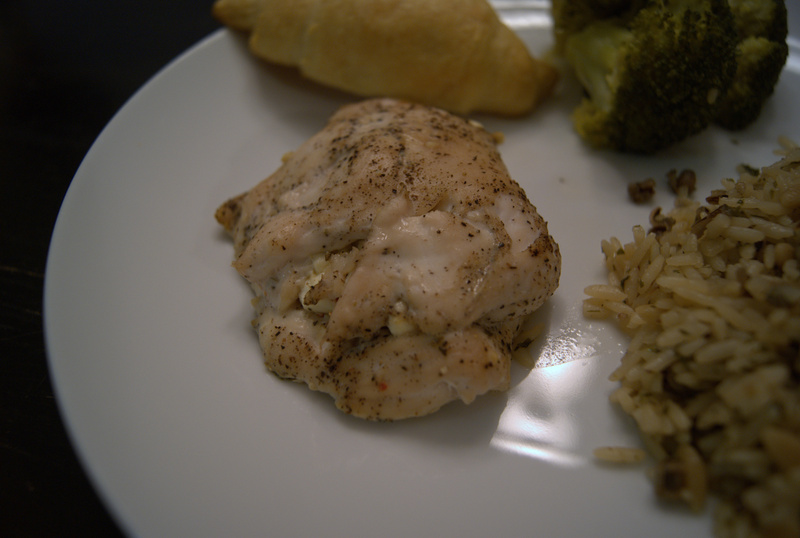 Now, it’s called “stuffed” chicken, but the feta is really wrapped inside the chicken. Anytime I make chicken, I actually pound my chicken breast out to tenderize it and doing so for this recipe works perfectly because it creates a little blanket of chicken so the feta can just be spooned on and wrapped up. Now, I hope my process of “prepping” the chicken doesn’t sound daunting. I’ve gotten the impression that everyone prepares their chicken for cooking a little differently. I wash my chicken, pat it dry, trim the fat and that horrible white tendon that runs through the middle of the breast, cover it with plastic wrap and pound it with a kitchen mallet to flatten it out. I can’t stand to bite into any fatty chicken pieces, so I’ve become a pro at removing any fat from the meat. And, i love when chicken is tender and juicy (who doesn’t? ), so I always tenderize it before cooking. It might sound time-consuming, but it’s only about a 10 minute process at most and sooooooo worth it. Preheat oven to 400 degrees. 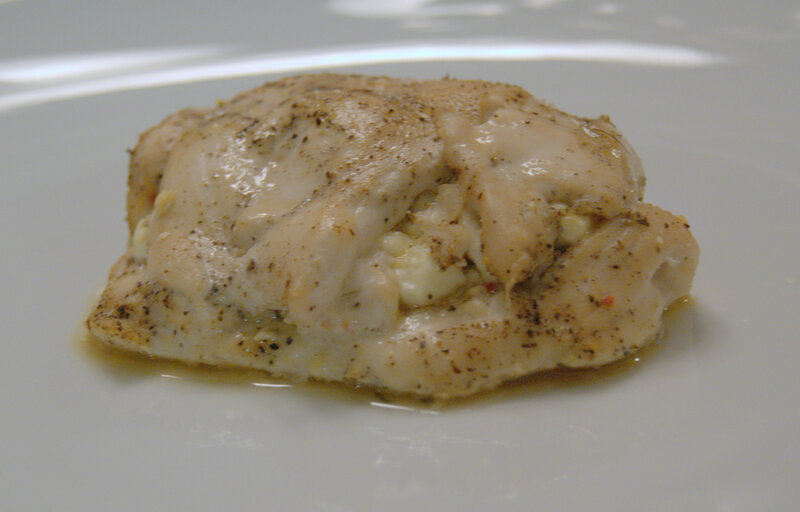 Wash chicken, pat dry and trim fat using a large cutting board. 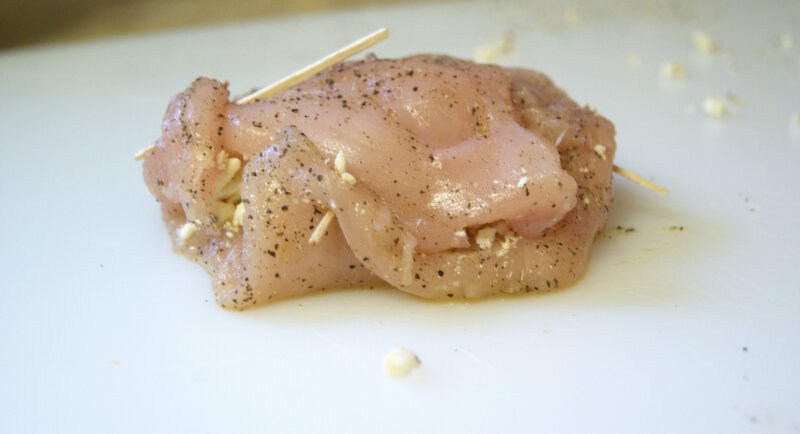 Place a piece of plastic wrap over the chicken (where is covers the chicken completely) and pound it with a kitchen mallet until it is about 1/4″ thick. 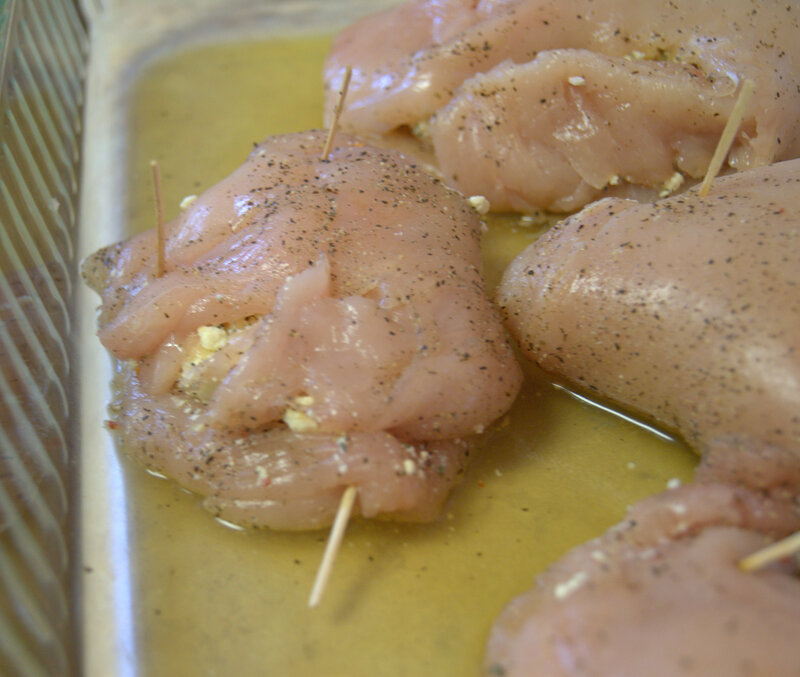 Rub about 1-2 tbsp of olive oil all over each piece of chicken and sprinkle with salt and pepper. 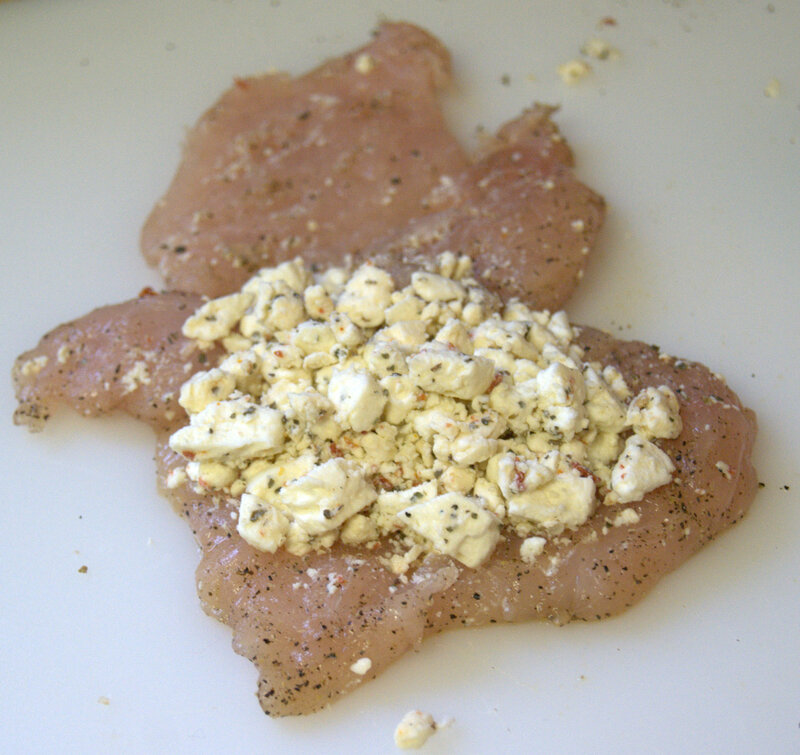 Spoon 2-3 tbsp of crumbled feta onto one end of the chicken and fold the other end over the feta. Secure using a few toothpicks and gently move the chicken to a baking dish. Once all the chicken has been stuffed and moved into the dish, add about 2 tbsp of chicken stock or broth (this is optional) – i’ve cooked this plenty of times without the stock and it turns out perfectly. But, I like to use this liquid to spoon over the chicken after it’s done baking to give it a little extra juiciness. Bake for 30 minutes or until the inside of chicken is no longer pink. 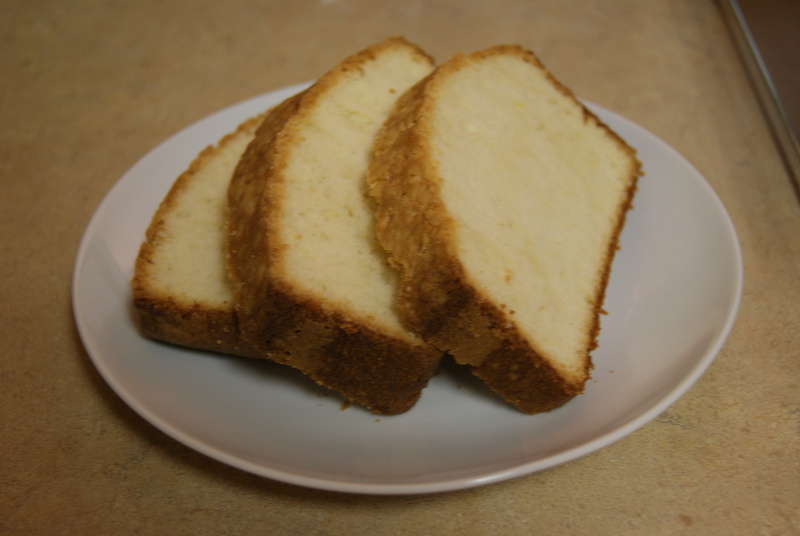 When you think of eating a big slice of delicious cake, do you really think of pound cake? Probably not. But, try this cake once and you will crave it again and again. Best pound cake I’ve ever had, by far. 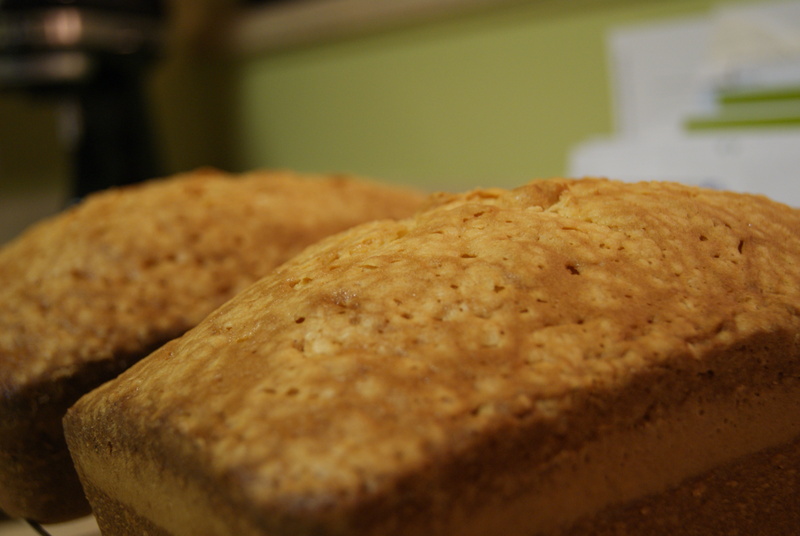 It’s so moist and dense and the top crust is absolutely the best part of the entire cake. Christopher and I fight over the top crust…it’s that good. Mini-loaves - arn't they cute? This cake is such a “special” cake – it’s just so much better than any ordinary cake. It’s amazingly delicious and after it’s done baking it literally pops right out of the pan and keeps its perfect cake shape. 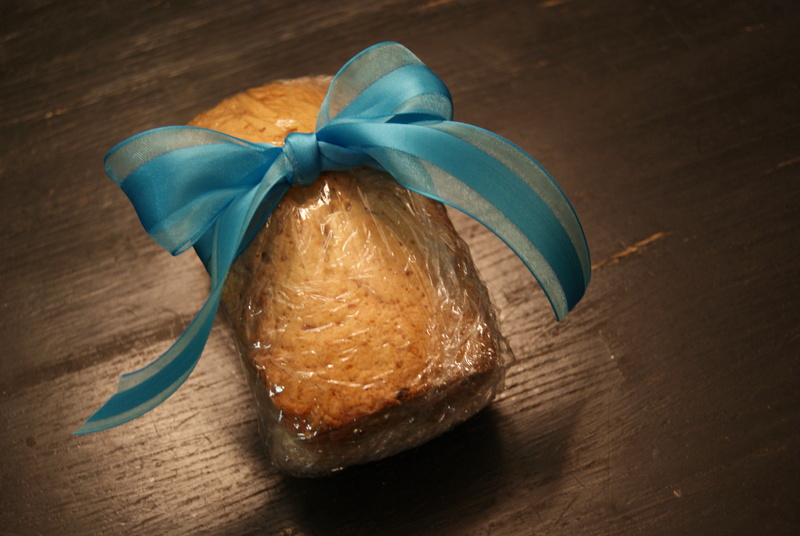 So, you can wrap it up, put a bow around it and it makes a great gift! I made 2 of batches of this cake this weekend – one batch for me and Christopher to enjoy and another batch of mini-loaves to give away to friends. 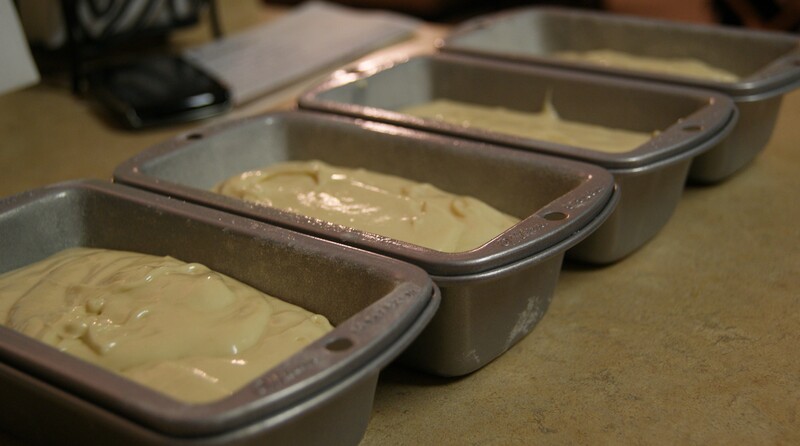 One batch can fill 1 bunt pan, 2 loaf pans, or 6 mini-loaf pans. The only difference in cooking times is that the mini-loaves only need 10 minutes less time in the oven. Preheat oven to 300º while mixing cake. Grease tube cake pan, flour well and have ready. 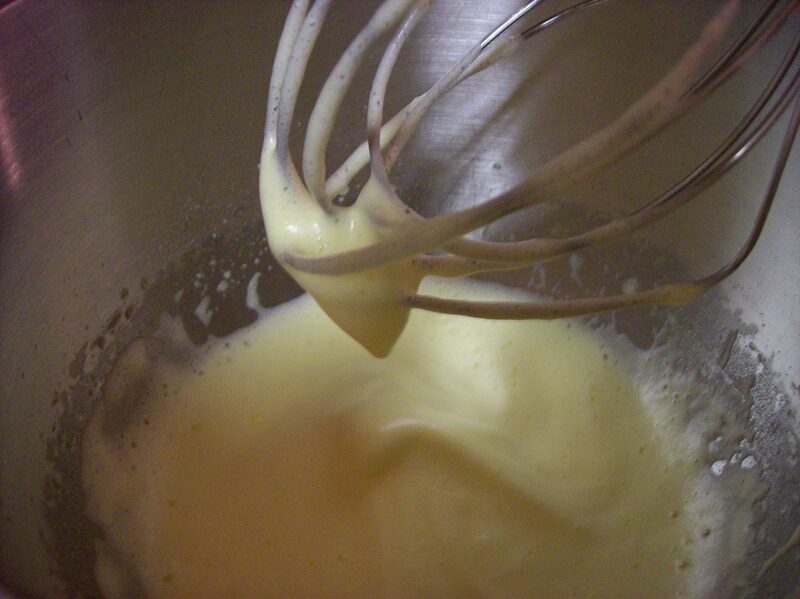 Using electric mixer, cream Crisco well, add sugar and beat. Add sour cream and mix until creamy. Add eggs, one at a time and beat well. Mix in baking soda, salt and vanilla until well incorporated. Add flour that has been sifted 3 times and mix until smooth. 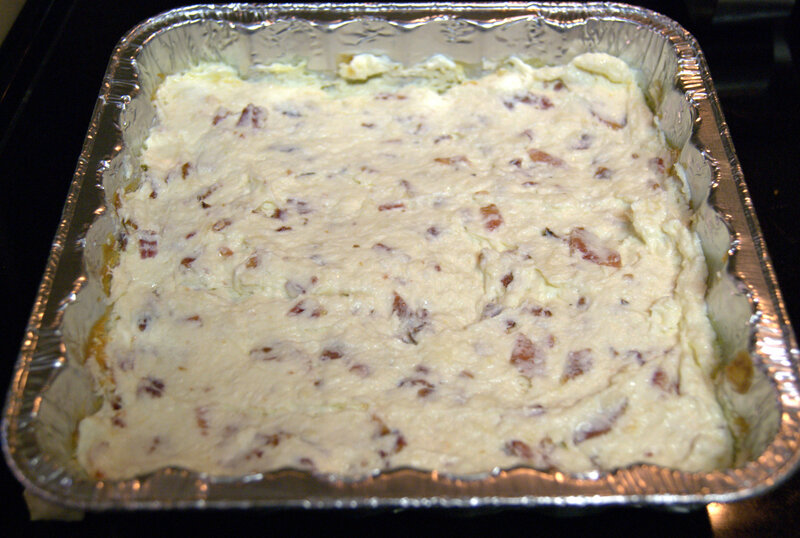 Pour batter into pan and bake at 300º for 30 minutes. Raise temperature to 325º and bake for an additional hour (only 50 minutes if using mini-loaf pans) until the top is golden brown. Let cake cool for 5 minutes and then turn out on cake plate. Who wouldn't want this gift? 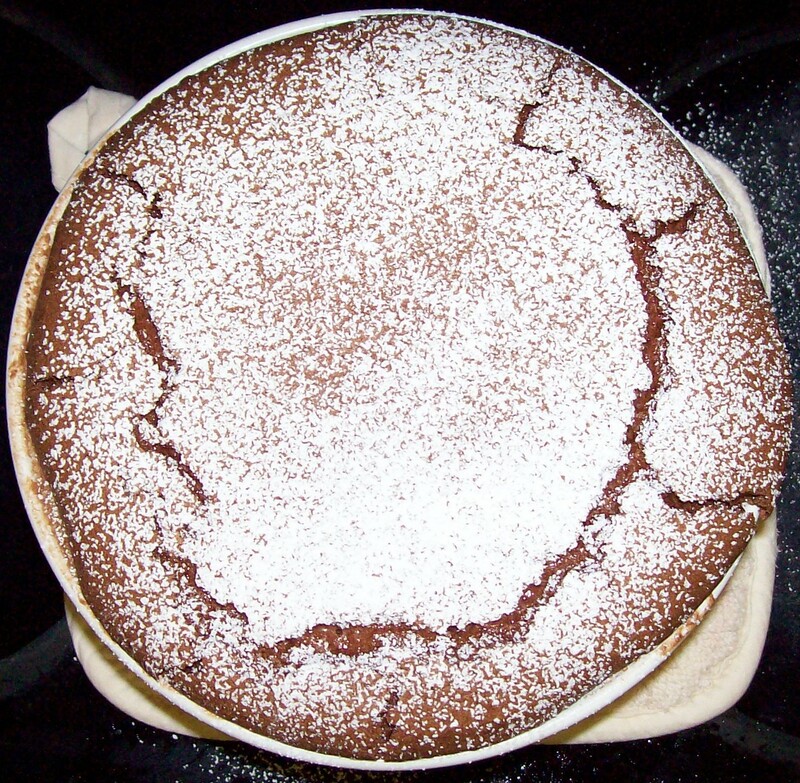 The first time I tried chocolate soufflé was during college (over 6 years ago) and have wanted to try my hand at making it ever since! So, I guess over these past 6 years I built up in my head that this was a difficult dish and I needed a brave day to attempt it. Well, that brave day came last week and it turns out that this fancy dessert….not so difficult at all. 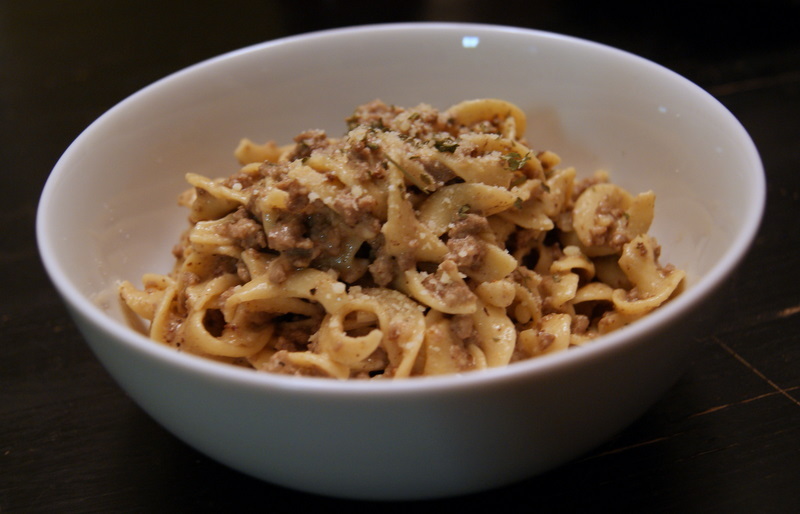 There’s some whipping and folding involved, but overall pretty simple and seriously yummy! I guess I’d call it a cross between chocolate mousse and flourless chocolate cake, maybe?? Many of the recipes out there prepare this in 6 ramekins, but I wanted to make a true soufflé in my brand spankin’ new soufflé dish. So, I used Paula Deen’s recipe and modified the cooking time just a bit to allow the soufflé to cook through properly. Now, I’m definitely not a scientist when it comes to baking, but do not be intimidated by this recipe, as I’m pretty sure you can’t mess it up. I’ve made it twice since last week, yes it’s that good, and I’m pretty sure I over whipped my egg whites and under whipped my egg yolks both times and it came out perfectly. 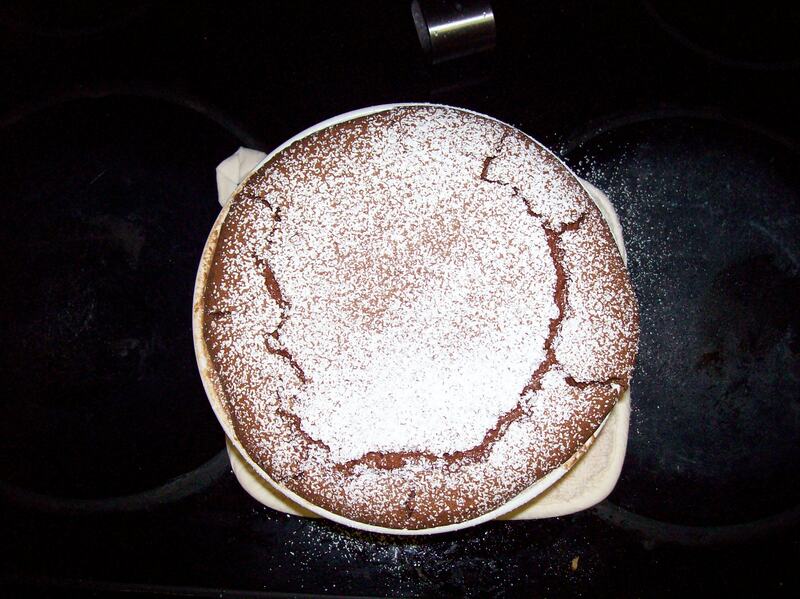 Oh – and the leftover soufflé is amazing right of the fridge! You will be scraping the bowl to get every last bit of this! Set an oven rack in lower third of the oven and preheat to 400 degrees F. Put a large cookie sheet on bottom rack. Put the chocolate and butter in a medium bowl. Microwave at 15 second intervals for a minute or so until melted and smooth, stirring each 15 seconds. Stir in vanilla extract. Set aside. You can either bake immediately or cover and set in the refrigerator until ready to bake. Bake until the soufflé rises about 1 1/2 inches from dish, and the tops are touched with brown, about 35-40 minutes, until the top is browned. If you would rather use 6 ramekins, cook for only 18-20 minutes. 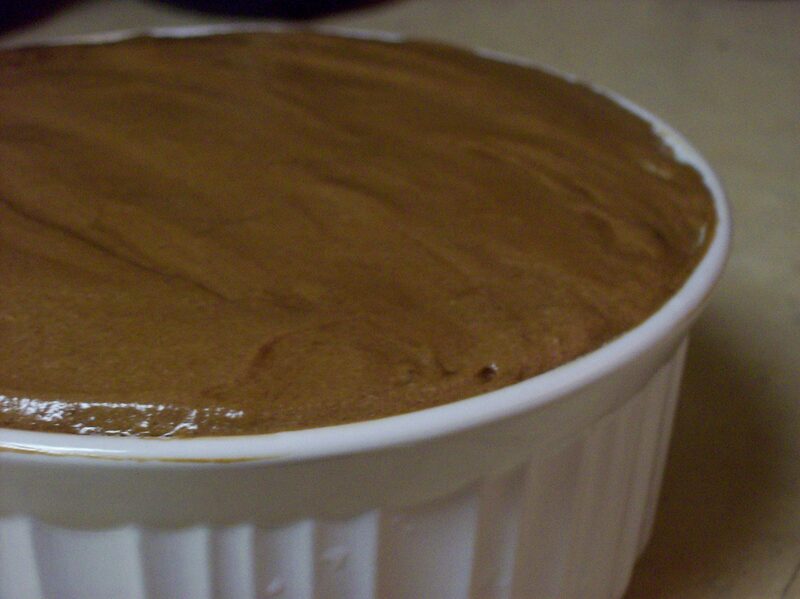 Remove from oven, dust with confectioners’ sugar and serve immediately. 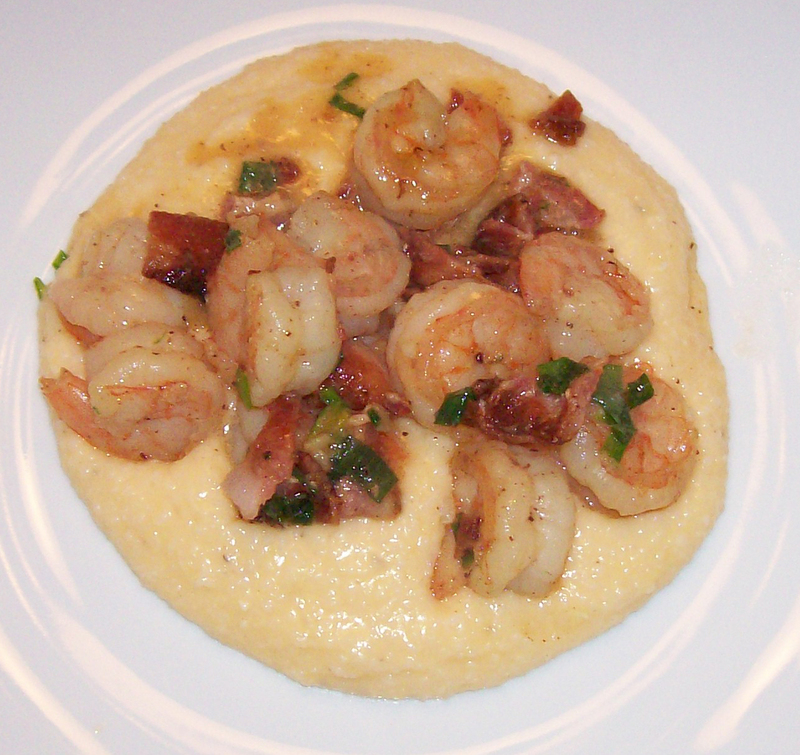 Shrimp and grits is one of my favorite dishes and SO easy! Shrimp….good. Grits…good. What’s not to love? I stumbled upon this recipe from Joy the Baker and it looked delicious (her pictures are amazing) and super simple. Bring water to boil then add grits, making sure to whisk to prevent clumps. Add a bit of salt and pepper. Lower heat, bring to simmer and cover until water is absorbed. Refer to directions on your box of grits, as cooking times may vary. Once grits have thickened, remove from heat and stir in butter and shredded cheese. Fry the bacon in a large skillet. When cooked through remove from the pan, chop or crumble into bit-size piece. Reduce heat to medium, add garlic and shrimp into the bacon grease pan and cook until shrimp until your desired doneness – I prefer the shrimp be pink and firm. I can always tell when they’re ready if the shrimp become shaped like a tight letter “C”. Add lemon juice, bacon, scallions and salt/pepper to taste. Cook for another three minutes. Don’t skimp on the lemon juice – it adds such a GREAT, fresh splash of flavor. 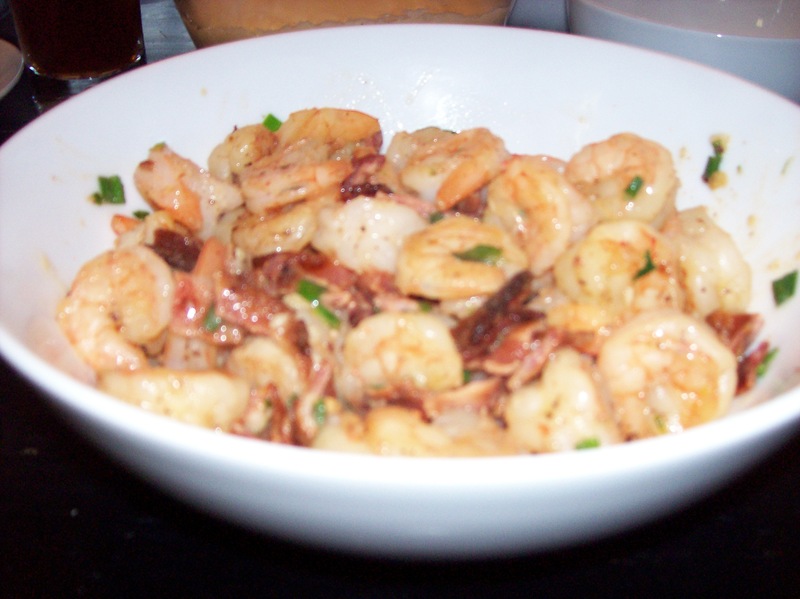 Spoon the grits into individual plates or bowls and top with shrimp mixture. My husband, Chris, says that you may also want to garnish with additional sliced scallions. Serves 4 hungry people. Enjoy! Enter your email address to subscribe to Pots and Pancetta and receive notifications of new posts by email.